The storybook birdhouse project, which would be a fun activity to do with kids who've grown out of a few of their children's books. The naturally flavored water with cucumber or grapefruit, however I think it would be important to add that using plastic water bottles aren't the greenest option. Using tap water or filtered tap water is not only a greener option than water in plastic bottles, but is often healthier as water in plastic bottles isn't regulated like tap water and may result in contamination by Pthalates and other chemicals found in plastic. The idea of having socks at the door for folks to be welcomed to take their shoes off. Not only does taking your shoes off a great way to keep your floors and carpets clean, it also prevents a lot of toxins your shoes come into contact with out in the world from making their way into your house. I would have liked for that comment to have been made to suggest that this is something we might all want to start doing. But, I did learn from Danny that putting rolled up newspaper in the shoes you take off can absorb moisture and odor. 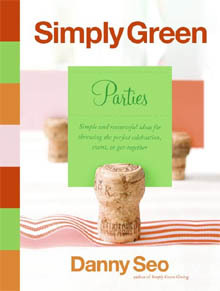 Although this book is not a "wedding" or "event" book per se, it is filled with helpful hints and smart remarks, making it an easy and intelligent read, to say the least. It's also filled with great ideas that can be used in the wedding and event arena, as well as every day of our lives. So why not?